Sidney Slon/Pipe Dream Photographer Junior midfielder Amelia Biancardi scored a hat trick against UNH, and has now recorded 10 goals in the last three games for Binghamton. 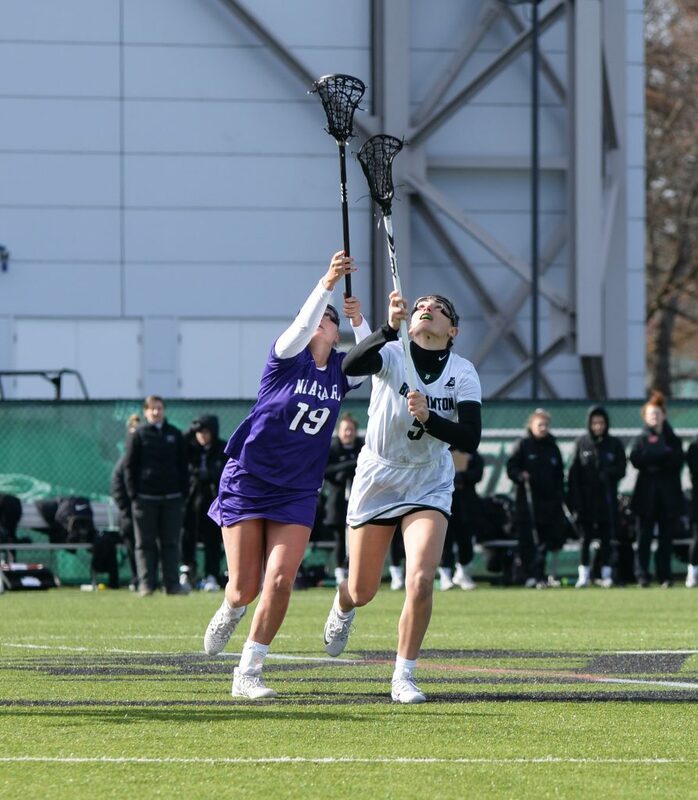 In its worst start to the season since its second Division I campaign in 2003, the Binghamton women’s lacrosse team dropped its ninth consecutive game on Saturday. After failing to triumph throughout nonconference play, the Bearcats (0-9, 0-1 AE) dropped their conference opener 12-10 against New Hampshire. After the Wildcats (6-3, 1-0 America East) scored the first goal of the game, senior attack Olivia Batista tied the game at one for the Bearcats. The teams exchanged goals in a well-contested period. All throughout the season, BU has struggled with defensive breakdowns in critical moments, and a similar situation unfolded at the end of the first half. Sophomore midfielder Alyssa Sanchez capitalized on a free position to tie the game at six with just 31 seconds remaining. Unfortunately for the Bearcats, UNH captured the ensuing draw control and ran right down the field, scoring with just five seconds remaining in the half to take the lead into the locker room. Binghamton played competitively throughout the entire second half, including a sequence in which Batista, freshman attack Emily Masera and junior midfielder Amelia Biancardi scored three consecutive goals, giving BU a 9-8 lead. Biancardi’s goal was her third of the game, marking her second hat trick in three games. Scoring a combined 10 goals in her last three games, Biancardi has played outstandingly as of late for Binghamton. Her 13 goals and 16 points lead the team, and she has already set single-season career highs in both categories. After Binghamton’s three-goal run ended, New Hampshire scored four of the game’s final five goals, earning a hard-fought 12-10 victory. Despite its overall record and the end result of the game, Binghamton competed well for a full 60 minutes in a matchup against a talented Wildcats team. In addition to Biancardi, junior midfielder Alissa Franze continued her successful junior season on Saturday, contributing two goals and extending her scoring streak to four consecutive games. After coming off the bench last season, Franze is among several new faces to have success stepping into starting roles on the team this year. Other new starters this season include Sanchez, classmate midfielder Kelly Quinn and sophomore defender Sam Fama, all players who have performed well after having limited playing time last season. As conference play is now underway around the America East, the stakes are elevated for the Bearcats in a competitive conference. Stony Brook and Albany are strongly favored to take the top two spots in this year’s conference tournament, with Hartford still developing its new program. Thus, Binghamton is left competing with New Hampshire, Vermont, UMBC and UMass Lowell for the remaining two berths. After losing to UNH, the Bearcats will have to convert their recent strong efforts into wins in the near future in order to return to the conference tournament. With a week to prepare for its next AE opponent, the team has the opportunity to make the necessary adjustments in a nonconference matchup against upstate rival Cornell Wednesday night. First draw control against Cornell is set for 5 p.m. from Schoellkopf Field in Ithaca, New York.